Bose is popular for its noise-canceling headphones. They likewise produce a variety of standard headphones. The Bose SoundSport Wireless is one such product. But this time, Bose targets a completely diverse customer type from the usual. 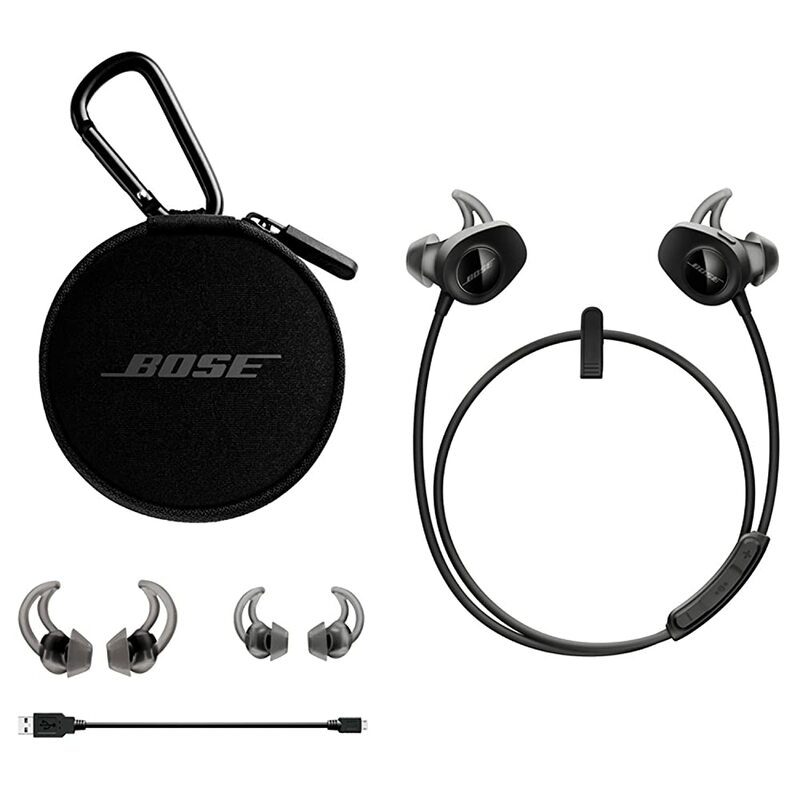 The Bose SoundSport Wireless (affiliate link) popularity indicates that they are loved by many. Why is that? The Bose SoundSport Wireless headphones are aimed, basically at sporty types. Are you the type which tries to keep fit and at the same time you want to listen to your favorite music? The headphones feature Bluetooth connectivity, are portable and light in weight. They come in four different colors and with a built-in battery. You can also make and take phone calls because they have a microphone. A handy remote control is built in on the neckband. They are sweat- and weatherproof. The sound quality is quite lovely, as well. What’s the difference between the Bose SoundSport Wireless and their competition? Not much if you ask me. If I take a look at the paper, there is not much of a difference. The battery life is not extraordinary. Bose says it should be up to six hours per charge. They are sweat- and weatherproof, IPX4-rated. There are only three pairs of the StayHear+ ear tips provided in the box. That’s certainly not saying they are a poor pair of headphones. So let’s have a closer look at the features in detail. The ear tips fit healthy and they won’t fall off easily. They sit on the outside of the headsets canal. The umbrella tips are kitted out with rubber wings. So they hook into the outer part of your ear, locking them in place. Do you love to run long distance around the streets while enjoying your favorite music? Imagine a car is coming at you and you won’t even notice it, horrible. You better want to hear some of the things happening near you. Most earphones sit in way too deep. Not the Bose SoundSport Wireless. They enable you to hear what’s going on around you. This is definitely a plus. The neck cable connection has the right span. Wait for a second, neck cable? Yes, the Bose SoundSport “WIRELESS” are not truly wireless. The earbuds are connected by a cable, the neckband. Just the connection is wireless. Space between the ear tips is not too short and not too long. Don’t worry, the cable will not snag into the back of your sporty shirt. The earpiece enclosure protrudes around a centimeter out of the ear. But I have never sensed a feeling like they would fall out. Additionally, because of their lightweight. There is one thing I don’t like about the Bose SoundSport Wireless headphones. It is the positioning of the battery pack, handy remote control, and microphone box. They rest upon the part of the cable leading out of the right-hand earpiece. Whenever you jump, it will move the cable around. Bose should look at some of their competitors’ products. In my opinion, there are several out there who nail this part. The Sound quality is good and has the typical Bose touch. The bass is solid and meaty. It has a pleasingly weighty thump, although it isn’t blousy and indistinct. The treble is detail rich and the mids are as well pleasingly wide open. The Bose SoundSport Wireless (affiliate link) is maybe a tiny bit too polite. But the majority of you will use them while running, cycling or doing other sorts of activity. So this should not be an excessive problem. The umbrella tips make a little microphonic wire rubbing sound. Nevertheless, this should not be a problem, either. Overall the sound quality of the audio tracks I listened to, was top notch even without aptX support. On the paper, Bose gives the battery a whopping 6 hours of playtime per charge. Though if you have them on a lot, you will have to recharge them more frequently. This is a little disappointing, but it will be enough for most of you. A micro-USB port is located under a flap on the left earpiece. The charging is simple and quick, great. There’s a huge number of normal Bluetooth earbuds fighting for your cash. Especially competing inside the sports section is brutal. The Bose SoundSport Wireless are pricey for sports action earphones. They don’t come with a heart rate sensor or lighting for running at night, or other luxuries. So you could also just pick up a match of a competitor that has all the features you might need. The Bose SoundSport Wireless (affiliate link) is a moderate combination of pros and cons. They fit and sit securely. The positioning of the ear tips is good. You still may hear your surroundings. The sound quality is also great. Sadly, the cable slips to the side the moment you’re jogging or working. The battery life is not satisfying enough and they are quite expensive. In the end, it’s impossible to give these a thumbs up. You may want to look elsewhere and obtain better-designed sports headphone. Many of the competitors offer more features at the same price or for significantly less. Overall, the Bose SoundSport Wireless headphones are good, however, not really wonderful. Next articleVana Now Distributing E.A.T. Vacuum Tubes in U.S.